Relationships are like snowflakes in that no two are alike. Each snowflake is different because, well, because of science: One droplet of water forms an ice crystal and then attracts water vapor on its descent to earth, which crystalizes in different shapes depending on the many different weather conditions it experiences along the way. Each relationship is different because of shared moments: Your first meeting, combined with every little thing you’ve done together since, makes your bond unique. 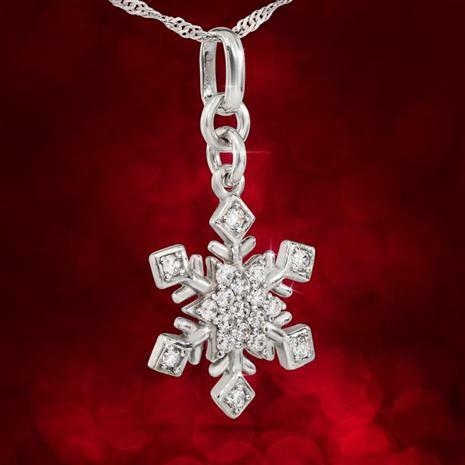 The Snowflake Romance Pendant is a simple but beautiful way to celebrate your relationship. Made in Italy of sterling silver that’s as durable as your love, and accented with 19 lab-created DiamondAura® rounds, which shine as brightly as your passion.